Parma ham or prosciutto is often a mainstay of Italian antipasto dishes. The dried, cured ham can also be used as part of a salad and other interesting dishes. The thinly-sliced version of Parma ham can be wrapped around grissini and may also be eaten with watermelon. Whether served with vegetables such as asparagus and peas or part of a pasta sauce or stuffing, the Parma ham is a versatile way to spice up a meal. The Rocket and Parma ham salad is perfect if you are looking to enjoy a simple yet beautifully-arranged salad. It can be eaten as a starter for lunch or dinner as a light lunch or midday snack itself. 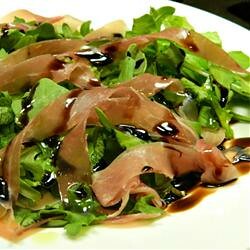 To prepare, gather 1 (7 ounce) bag arugula, 7 ounces Parma ham, torn into thin strips, 1/4 cup olive oil, and 1/4 cup balsamic vinegar. To prepare the salad, arrange the arugula on a large flat platter, top the arugula with the prosciutto, and drizzle olive oil and balsamic vinegar over the salad. The Parma ham salad can be “jazzed” up by adding cashew nuts as well as some parmesan cheese.